Seldom in our lives are we presented with something so unlikely. As someone who lives in North America where the ancient past is considered 50 years, what are our chances to chant Compline in an 800-year-old Spanish Monastery’s Chapter House, or any 800-year-old structure? 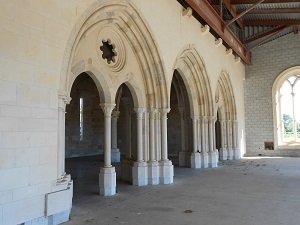 Even if we could make a pilgrimage to Spain, we would find the main building of the Spanish Monastery has moved to Vina, in Northern California. William Randolph Hearst had workmen disassemble the Chapter House (built by the Monks, 1190-1220) and ship it to San Francisco in 1930. He had a vision to construct a bigger and more magnificent “Hearst Castle”, and the Chapter House would be a key element. He lost interest as he lost in the 30’s economy, and the limestone ‘stones’ gathered moss in Golden Gate Park in San Francisco. 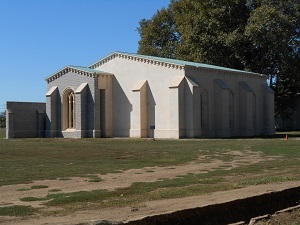 The first abbot of the Cistercian Abbey of New Clairvaux petitioned the City of San Francisco to buy the stones for reassembly on the grounds of the abbey at Vina. They accepted his bid of one dollar and shipped the stones to the abbey where they were slowly reassembled by skilled stone masons. Over time some stones were pilfered from the Park and the masons had to improvise with some new pieces. On an Anglican men’s retreat of the Holy Trinity Episcopal Church (est. 1854) in Nevada City CA, we decided to chant Compline in the confines of the ‘sacred stones’, as they are called. We had two men who had sung Compline before and two volunteers who could read music. I put a simple, medieval Compline together in book form and we had one rehearsal with the two that had never sung Compline before. The result was authentic, if not great. It was a truly mystical experience. You simply were not in the here and now. The ‘Stones’ seemed to radiate some ancient vibes of worship long past.